Men's Top Shelf Padded Bike Short - Why Compression? Want great compression and muscle support? 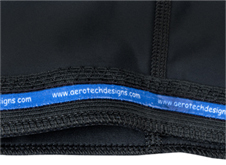 Aero Tech Designs presents the Men's Top Shelf bike short. 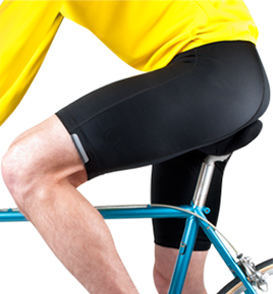 This padded bike short is designed for long distance bike riding. It has an anatomical, eight-paneled design. This garment is made from a special technically designed fabric that has high Spandex content. The compression from the fabric of our Top Shelf Bicycle Shorts hugs the muscles for support and reduction of muscle fatigue. These bike shorts move freely with the pedaling motion to prevent chafe by design. We eliminated the seams between the legs and the smooth inner leg reduces abrasion and saddle sores. These bike shorts keep you comfortable with high quality fabric and a long distance chamois pad that is imported from Italy and engineered for long bike rides. The chamois padding is a chafe free, long distance pad that has multiple levels of cushioning. The Top Shelf chamois pad is full of technological engineering. One key feature is the Multi-Level-Pad (MLP) which is a 3D engineered collection of foam pieces that fits snugly within the curves of the legs and torso to create a perfectly smooth and abrasion free chamois padding. The Top Shelf Chamois pad has an excellent fit which is impossible with one piece pads. The surface of the chamois is an antibacterial, micro-fine brushed polyester fabric that wicks the perspiration away from the chamois area to keep you dry and comfortable on long rides. You will appreciate the great fit of the Top Shelf Chamois pad, a fit you can't get with a seamless construction. Like a baseball, the chamois pad has seams cut with curves to fully and efficiently wrap all the curves between the legs. The crotch area has three severe curves, the torso and two thighs which all have a steep curvature. To maximize the fit, it would be impossible to fit all these curves with a single flat piece of fabric. To effectively protect this area, the top shelf chamois padding is assembled by sewing curved wings onto the primary pad area, this creates an excellent fit that maximizes protection and saddle sore prevention. These bike shorts move freely with the pedaling motion to prevent chafe by design. Top Shelf pad is an anatomically designed pad for the bike riding position. The Multi-Level Pad M.L.P uses multi-level production technology and Multiple Layered Foams to improve comfort by relieving the pressure points between the body and the bicycle saddle. What makes this pad special? It is the fantastic fit that comes from a highly engineered design that fits all the curves that we have between the legs and around the body's pelvic area. The side wings on this pad offer up excellent fit around your legs and torso. This excellent fit is not available with one piece pads. The surface of the chamois is antibacterial which is important to prevent the growth of bacterial which lead to saddle sores for long distance cyclists. Pad Thickness: 10mm in saddle area, 5mm on sides Anatomical design for riding position: ergonomic concepts were employed for the design of this bike short that hugs the muscles for support and reduction of muscle fatigue. The M.L.P (Muliti-Level Pad) uses multi-level production technology to improve comfort by relieving the pressure points between the body and the bicycle saddle. 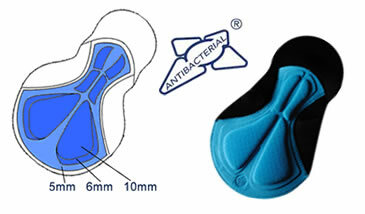 The new pad system incorporates the long established Hygienic fabric. Category: Long Distance Cycling Road or Mountain Biking. The pad system incorporates the log established Hygienic fabric. 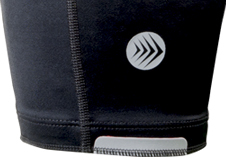 The M.L.P.is a cycling seat pad made of polyester microfibers. The chamois pad is engineered across the ischial bones so that you can ride a long distance with your ischial bones padded. The Top Shelf long distance chamois pad is 10 MM thick in saddle sit bones area. The best fitting chamois on earth - there is no other pad that will fit into your crotch curves better than this highly designed and engineered chamois pad. 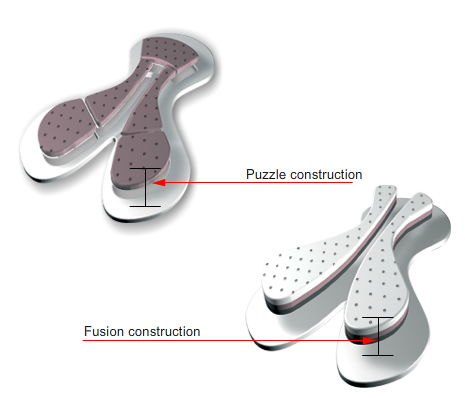 The bike short has a MLP (multi-level-pad) that is 3D engineered for effective support of the key sit bones. The keenly designed shape eliminates chafing and smooths out the crotch area for maximum comfort on long bicycle rides. We recommend you grease up the pad with an anti-chafe cream when riding long distances. If you want our thickest pad, try the elite chamois pad which is for 100 mile rides. It has a dense chamois pad that is our favorite for century rides. Great shorts. Extra long pad in the front offers more comfort. I have 4 pairs and would buy again. Great customer service as well. This short is ducking comfortable. This short is ducking comfortable. I have tried a few bought on amazon, made in China. Yes they are much cheaper, but the short from aero tech is much much much more comfortable yet less bulky. I will definitely keep on buying the products from Aero tech. Good price for a good short. These are great shorts that make a ride that more satisfying. These are the most comfortable shorts with a well-padded chamois, for a fraction of the cost of other competitors. The fact that there made in the USA right here in the beautiful city of Pittsburgh, makes it all the more rewarding. Thank you, Aerotech! Not what I expected the quality was good but the pad was NOT. Love the bike shorts. Fits under regular gym shorts so no one has to know/see that I'm wearing a padded shorts. Makes a huge difference on the bike!! Plenty comfortable on a fifty mile ride. Excellent shorts! Better than the Bontragers I've been using for the last 2 years. Very high quality in every stitch and super comfortable. The top shelf pad is really good, I'm not sure how it compares with the other pads Aero Tech Designs offers but these are a great choice for a first time buy. I highly recommend, also for the price, made in the USA(Pennsylvania represent). It's a solid deal! My first experience with Aero Tech products. Limited use so far due to weather, but the shorts fit well, have more chamois than any I have tried-takes a little getting used to--I am pleased so far. I have been riding a road bike for a number of years and am very aware of the importance of shorts. Based on a recommendation from a friend,I decided to try the top shelf short. I am very pleased with this product. I got these shorts after I got another pair of the less expensive Aero Tech shorts that were not working for me. I'm glad I made the exchange as these are a far superior short for road and mountain riding. The chamois is thicker than I'm used to and wasn't sure I would like them, thinking that it would be too thick and bunch up. When I put them on the chamois felt like a diaper but as soon as I sat on the saddle it conformed to my body and was/is very comfortable. The shorts stay put for the whole ride whether you are in or out of the saddle. The chammy is thick at the sit bones and thin where you don't need the padding which makes then very comfortable. I have not had any chafe issues with these shorts and I don't use chafe cream. The legs stay in place for the whole ride with just enough compression. As others have said the front is slightly lower than the back which is part of the reason these shorts are comfortable. I like that the front is slightly shorter, as when one is in riding position, you are leaning forward and not having extra material there in comfortable. At the same time it is nice to have more material at the back for the same reason, as you lean forward, it is comfortable to have extra material to cover your back( Look Ma no plumber crack!). I am 5' 8" and 146 pounds and I always take a med. I got these shorts in a med and they fit very well. I'd like to give a shout-out to Chris for putting the service in customer service at Aero Tech. Thanks for your help Chris. Always buy these shorts, tried silver for the first time, always great, ride up to 150 miles at a time with no issue. This is the fifth purchase of these shorts! Enjoy spending money with a local company. High quality & great fit. I recommend the larger size if your are in the overlap zone. I love that they are made in USA! I've owned three pairs of these shorts, and they are the best cycling shorts I've owned for long rides in the saddle, and what a great value! I tried buying a more expensive brand with a fancy logo, and ended up throwing them out and going back to the Top Shelf shorts after 3 rides. They are sized true, very comfortable on long rides, and best of all, the padding doesn't bunch up in the back like an oversized diaper. They are durable, a pair lasts me for a whole riding season before showing any wear. I hope Aero Tech never stops selling these! Chamois pad is good but not great. These shorts are obviously well made, they fit well and the price is right! Just used these shorts at the end of a week long tour, I was really impressed with how comfortable they were and I liked the fabric they are made from, feels very high quality. Pad is a little too thick for hot weather. Other wise works well. I made Aerotechdesigns my preferred shopping store for my riding clothes years ago without any regret. All their shorts, shoes, and socks are quality and made in the USA. As a road cyclist, I need shorts that are comfortable and breathable, and again they met my expectation. I highly recommend them to everyone. Thank you for being there and listening to us riders. A slightly thinner foam pad than the gel shorts I've been wearing which is why I bought them. The thick pad seems to bunch up in the wrong area causing numbness. The pad in the Top Shelf is a better design too...it doesn't have padding near the middle where you don't need it. I only wonder how the FOAM pad will hold up versus the gel. Might I suggest a similar design pad in gel? Same shape and thickness as the Top Shelf foam but gel?